When temperatures are still hovering above freezing, local community triathlon race directors are working on their event checklists, fine-tuning details such as ordering finisher medals, t-shirts and awards, as well as ramping up messaging to boost awareness. These directors take their jobs seriously, pouring in hours of preparation and planning to provide a positive, festive atmosphere in their park district that will appeal to newbie and seasoned athletes alike. 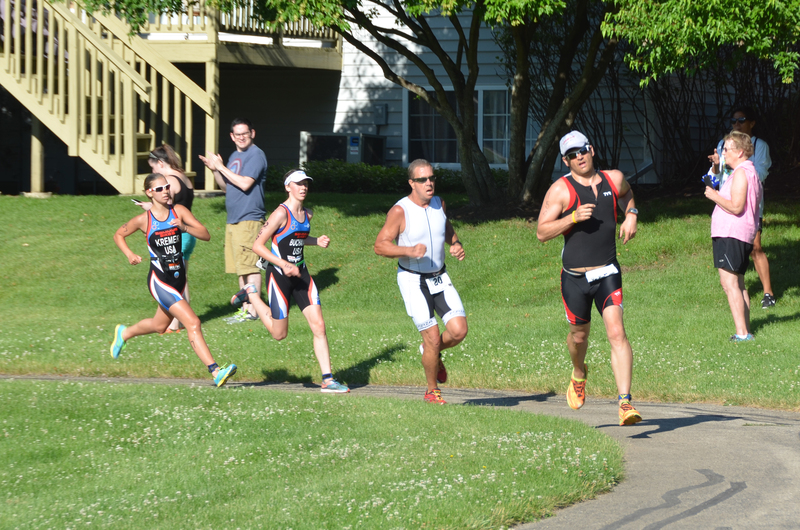 If you are new to triathlon, a community event is the perfect opportunity to jump in, try the sport in a non-intimidating, friendly, small, yet familiar environment. Plus, these events typically offer several pre-event preparation opportunities to help newcomers feel at ease with the sport. 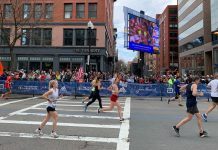 “We follow up with swim review at the venue the day before the race, complete the bike course the week before, then Friday of race weekend, conduct two two-hour walk throughs of race logistics including bike rack procedures and parking,” LoPresto says. Seasoned athletes are usually more than willing to help support and teach new athletes, pointing out how to set up their transition, where to stand in their wave and where to spot buoy’s. And if swimming in a lake makes you a bit nervous, have no fear; the race directors for the Lake in the Hills Triathlon, Matt Kidd and Shane Firsching, lead open-water swim sessions Wednesday nights. On the two Saturdays leading up the race, they hold group rides and runs (a brick workout) on the course. Kidd and Firsching are there for the workouts and love to connect with the athletes, who can ask them questions about the race and course to help put all athletes at ease. Small venue races cap the number of participants who can enter, since there is limited room in transition and on the course. Glenview and Lake in the Hills caps entrants at 400, while Wauconda allows for 600 for both sprint and Olympic distances. On the opposite spectrum, the Transamerica Chicago Triathlon is one of the largest in the world, with around 8,000 athletes registering. In a small venue, racers tend to know other racers and have the chance to meet new athletes; the atmosphere is friendly while community and healthy competition tend to build. The announcer for the Glenview Triathlon, the well-known Dave Kappas, announces names at the finish line, while volunteers hand them water, cold towels and a medal. The song, “Chariots of Fire” is played for the final athlete who crosses the line. Kidd and Firsching built new personalized bike racks with name plates and race numbers to make each athlete’s experience special. These are common strategies that can be incorporated into a smaller race, making each participant feel important and supported. Volunteers are key to comfort and ease of race day, and for local races, the volunteers are often community members who know the area and event well. Plus, if you’re nervous to try a smaller race, volunteering is a great way to check out the scene and learn about the race before participating. 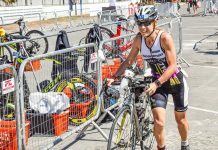 Kathleen McInnis, race director for the Glenview Triathlon since 2004, personally trains the local volunteers on how to rack a bike and provides them a handout with answers to common athlete questions. “Each athlete is greeted, lead to the check-in, marked with their race number, and directed to the race talk. We minimize confusion for the athlete,” says McInnis. Community courses are prime for cheering. Bike courses wind through neighborhoods so residents can cheer on participants curbside, sometimes setting up music stations or turning on sprinklers if it’s hot. The Lake in the Hills bike course takes riders through three communities; Lake in the Hills, Lakewood and Crystal Lake, bringing together those residents in a single event. The Glenview Tri run loops through Gallery Park so spectators can hang out on any part of the course to cheer on runners and see them multiple times. After racing 25 times, SanFaçon’s family finally came to see him at the Naperville Triathlon in 2017 during his transition from the bike to run. Seeing his wife and three kids at the finish was great motivation. “The sport trickles down. There things like this for kids. Mine now do kid races for fun,” SanFaçon adds. Because of the smaller participant numbers and condensed race site, local triathlons often have a charity aspect. What better way to support your community than by doing the sport you love while raising money for a good cause? Working with charities also creates great relationships within the community itself. 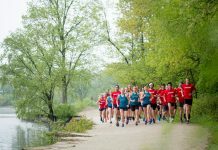 ET Batavia has a history of supporting charity organizations, with its original founder being a coach from a Team-In-Training. Last year, ET Batavia donated all of its profits to a combination of charity and community organizations, including the bike commission, fireworks commission and Batavia food pantry, who in turn helps with volunteers. The Glenview Tri included a Chicago girl’s track team one year offering them entries. Waking up an hour before a triathlon is nearly unheard of, but with a local community race, the dream becomes a reality. Avoiding long trips to the city or another state to get in all three disciplines, walking to your local community center makes for a fun and efficient race day. Plus, events put on by park districts and local organizations typically end with a fun post-race party. Celebrate your hard work and the community itself with music, food and mingling with other athletes, and who knows, maybe you’ll meet your next training buddy!